Quake Contesters :ZL3PAH (capt), ZL3GA, ZL4PW, ZL3NB, ZL3AB. looks like a good contest coming up! I confirm a team entry in the 24 Hour Restricted – Single Operator low power Unassisted section from Team Itchen Valley Veterans, located in Southern Hampshire. All are members of the RSGB affiliated Itchen Valley Amateur Radio Club. 5H3EE just dropped out so reserve is now in play. We are a brave bunch – not working Africa Dx Contest callers will be tough. Some readers may have noticed that the SARL contest calendar shows the All Africa DX Competition as running from 1200 UTC on 14th March to 1200 UTC on 15th March. As this largely overlaps with BERU, their choice of timing is likely cause problems for both events. The matter has been raised with SARL. Thanks for stepping up for the Team 1 captain role. I’ve just returned from a couple of weeks holiday so not much time for preparation this year. However I do intend to be active again in the 24 hour Restricted section from my home QTH in Melbourne (not at VK4KW). I’m happy to pick up the captain role again for Team 2. I’ll check with VK4SN, VK2PN and VK4XY to see if they are available to join again this year. As you say, we will also need to find a new team member. I’ll follow up with Martin VK7GN but I know he recently shifted QTH and this could hamper his ability to join us for the 2015 event. I note that both VK4BUI and VK2AYD were not far behind Martin’s score in the 2014 Open section, so I’ll reach out to them if Martin is unavailable. If Team Australia 1 and Team Australia 2 are going to defend our titles as Commonwealth Contest 2014 team champions and 3rd place getters, then we better get our act together quickly. As Barry VK2BJ is unable to captain VK Team 1 this time around and as no-one else seems to have come forward, I am (reluctantly – heaps of family stuff going on) putting myself forward again to fill this gap. My hope is that Brian VK3MI (who I understand is likely to be one of the multi-operators at VK4KW) is able to continue as VK Team 2 captain. 1. VK4SN 2. VK2PN 3. VK4KW (alias VK3MI) 4. VK4XY 5. To be appointed. In regard to position 5 in VK Team 2, the next highest finish was Martin VK7GN (3,870 points), followed by David VK2AYD (3,665 points). The fairest thing to do would seem to be to first extend an invitation to Martin and if he is unable to participate, then extend an invitation to David. However, first things first. Please could all the initial selections made above please let me know if you are are able and willing to take part again this year – and Brian, please let me know if you can take on the role of Team 2 captain. I also would be interested to hear from any other serious VK CW contesters outside of the above teams who would be interested in giving the CC a good ‘go’. The idea is to send Bob G3PJT VK team lists as soon as possible – we have only about a week to get our act together. If you can get back to me over the next couple of days, that would be a great help. Please note that in order to give VK Team 1 the best possible chance of winning, those in the team must agree to compete in the 24-hour open category. Thanks. Vy 73 Steve, VK6VZ Thanks, blokes! VE7RAC will again be operated by Brian VE7JKZ. A belated Happy New Year. We trust you and your family are all are keeping well. 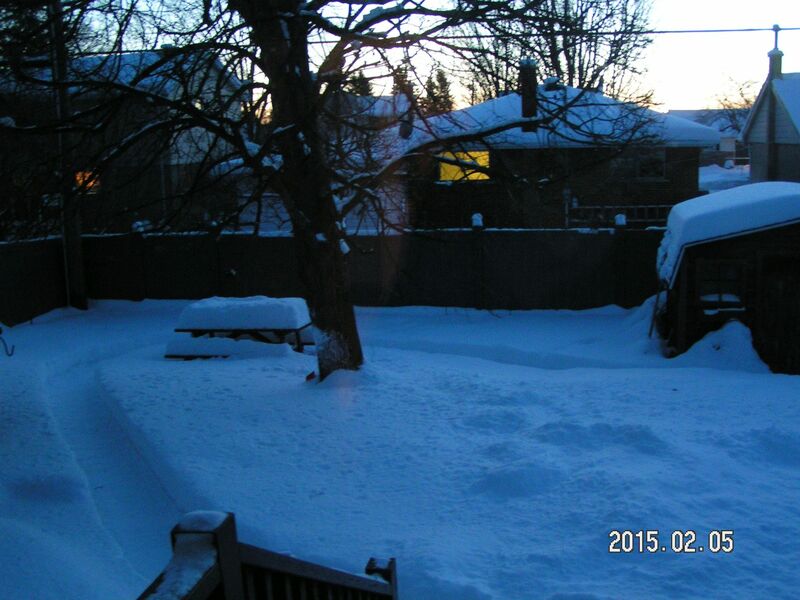 Not too much news at this end except that it is cooler than usual with temperatures dropping to the -25 C level at night and we have a moderate amount of snow (see attached picture of back garden at VE3HX). Weather permitting, I’ll be going to Lac du Cerf to operate as VE2AEJ – so whereas you are going south for BERU I am going north!